After paying the fee to enter the Arabuke Sokoke Forest at Gedi Forest Station Visitors’ Bureau, we want to look at a small piece of woodland just beyond the ranger post. It is now 6:15 a.m.. So pretty early. It would not be worth it much sooner. There are thick clouds in the sky. We walk in the cloud-filtered morning light a path behind the office. Here the Golden-rumped Elephant Shrew (Rhynchocyon chrysopygus) should occur. Unfortunately, we only see some dugging residuals. At a daytime roost for owls, we see a pair of Brown greater Halago (Otolemur crassicaudatus), the so-called Bush babies, nestled close together. Otherwise there is not much to see on birds; and also not heard. It is pretty quiet. Suddenly we see a beautiful Yellow Flycatcher (Erythrocercus holochlorus), which our guide calls Little Yellow Flycatcher. With his tape we can attract the Yellow Flycatcher so far that it manages in photo pose and sings eagerly. Later we will see Yellow flycatchers quite often. Mostly small family parties in mixed-species flocks that originated along a trail in a patch of evergreen mixed forest but also quite close to miombo woodland. 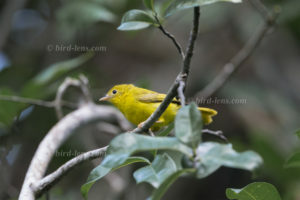 One Yellow Flycatcher had caught a caterpillar in the canopy of the mixed forest.